Jaguar Land Rover’s recent commitment to adding an electrified powertrain to every new model launched from 2020 doesn’t appear to be coming at the expense of raw performance. The Jaguar F-Pace SVR will be the next model to emerge from JLR’s Special Vehicle Operations division (SVO), and it’ll be one of the most powerful SUVs the British brand has ever produced. Auto Express understands that the car – previewed in our exclusive images – will make its global debut at next year’s New York Motor Show, before going on sale in the UK towards the end of 2018. Priced from around £70,000, it’ll become the most powerful and expensive F-Pace in the range. Development work on the Porsche Macan Turbo rival has been under way for some time, as Jaguar engineers attempt to hone the F-Pace’s chassis dynamics to match the best in class. It’s a sector that’s quickly become swamped with competition; the Alfa Romeo Stelvio Quadrifoglio and Mercedes-AMG GLC 63 are the latest arrivals, while BMW is already well under way with development of the first X3 M.
The design of the F-Pace SVR has been signed off, and our images show what is likely to be hiding beneath the camouflage of the prototype spotted testing. Deep front bumpers featuring gaping air intakes, a front splitter to improve downforce and bonnet vents to aid engine cooling will be the standout features on the front end. As with every SVR-badged model, there will be a quad exhaust set-up at the back, along with a new rear bumper housing an integrated diffuser to improve downforce. Jaguar will stick with the tried-and-tested powertrain that has appeared across a range of SVR models, including the Range Rover Sport and F-Type SVR. A 5.0-litre supercharged V8 and eight-speed automatic gearbox will distribute power to a permanent four-wheel-drive system. 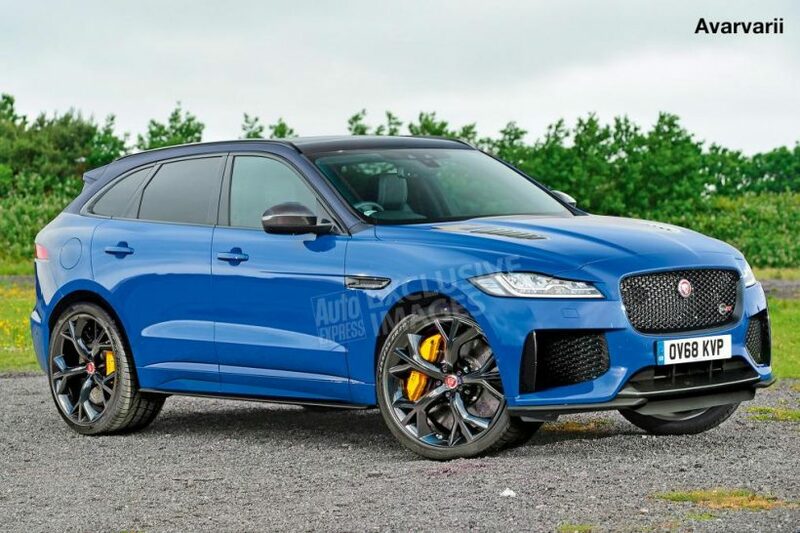 The F-Pace SVR will match the recently updated Range Rover Sport SVR for power, developing around 570bhp and 700Nm of torque; that means 0-62mph in around 4.2 seconds and a top speed in excess of 175mph should be achievable. The upgrades over a standard F-Pace will also include performance brakes, while more extreme carbon-ceramic disks will be offered to buyers, too. A re-engineered and stiffer suspension set-up will be fitted to the F-Pace; this will reduce the ride height by several millimetres to boost agility. Adaptive dampers will be made available as well. As a range-topping model, the SVR will also be kitted out with quilted leather bucket seats and carbon-fibre interior detailing. Jaguar will attempt to offset the added weight of the 5.0-litre V8 engine by fitting lighter components such as a titanium sports exhaust and forged alloy wheels. Despite that, it’s unlikely that the SVR will weigh less than 1,800kg, making it the heaviest model in the F-Pace line-up. As well as performance, SVO specialises in developing luxury models, although no Jaguar has received this treatment yet. JLR invested £20million in a new Technical Centre for the division last year; the F-Pace SVR will be the fifth vehicle (excluding the limited-run Project cars) to emerge. ← Facelifted 2018 Range Rover gets hybrid tech and more luxury!